You only need 50 NPs. WHAT!?! Was not this the Kadoatery!?! Strange things can happen when you feed small kittens... Are they kittens? Get your baked goods right. Missing food? That's what I call a drama show! Eroberi opened the door to her trophy case and looked at her trophies, fondly remembering the frustrations and triumphs they gave her. The Dice Escape trophy and her struggles to get the platform even working, let alone get enough for the avatar and the trophy. The Grand Theft Ummagine trophy, with its guards and water traps galore. She looked especially fondly at her gilded Kadoatie likeness, remembering how long it took her to learn about those hungry, baka kads…. ♡♡♡♡ Mewling Kadoaties called a young Eroberi as they begged for food. She frantically tried to find the Kadoatie Biscuits they wanted to be satisfied. She kept on going back to the Shop Wizard in vain until he refused to let her even peruse through the markets anymore. “Whoa there, too many searches!” he declared. “Try again at the top of the hour. ”The Fresh Foods shop always seemed to be empty or full of run of the mill items that she hated. Even the Trading Post never had the biscuits she needed, and if by chance one popped up, the user was asking an exorbitant price. Eroberi let out a frustrated sigh, wondering how she would ever feed 75 Kadoaties for the beautiful trophy and avatar. Eroberi opened the door to her trophy case and looked at her trophies, fondly remembering the frustrations and triumphs they gave her. We all have heard of the Techo Master. Over the years, many students have been in awe of his ability to levitate in addition to his seemingly infinite knowledge of the fighting arts. And in turn, many students have left the dojo out of frustration, even after having paid the codestones needed to train. Clyf, a pirate Krawk, laughed heartily, taking another swig of grog. His face was flushed with happiness. Him and his crew were sitting at The Golden Dubloon, basking in the glory of another day of piracy. 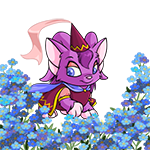 Faerieland had once been a magical kingdom that hung far above the ground of Neopia, sitting atop white, fluffy clouds which held the weight of the pink and purple buildings that were elegant creations. After the events of war, Faerieland had come crashing to the ground and remained there ever since, with the Faeries having to rebuild their civilisation.